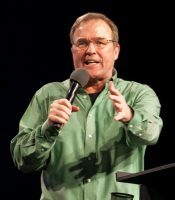 The above link is to a short video clip of false prophet and heretic Mike Bickle answering the question of whether a prophet today should be disciplined in some manner if what they prophesy fails to come to pass. One should expect a ridiculous answer from someone who has prophesied incorrectly in the past and is associated with nearly every false prophet in operation today. The Kansas City prophets, which Bickle is also affiliated with, have stated that a 65% successful prophecy rate makes you a pretty good prophet. How absurd and unbiblical. Beloved, as we have covered before, prophecy is hearing directly from God. In the Old Testament there was no ready access to the Scriptures for people. There were no printing presses. God’s people were also contained to the nation of Israel. These things combined for God to choose people to be His vessels for communicating with His people. Because God is never wrong and does not stutter, the success rate expected for prophets was 100%. God takes it quite seriously when people pretend to speak for Him. If they were found to be false, they were stoned to death.